An Indiana State University campus that has evolved during the past 20 years into a pedestrian friendly, tree-lined setting is in line for even more transformation in the next 20 years. 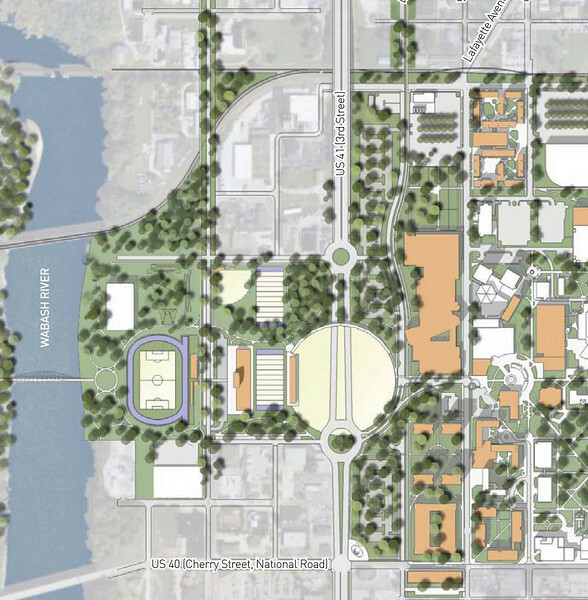 The university's Board of Trustees Friday accepted a new campus master plan that calls for renovation of several academic facilities, upgrades to student housing and athletic venues and improvements in campus traffic patterns, particularly for first-time visitors. "This is an exciting plan and it's doable. It will improve ISU and have a positive impact on downtown Terre Haute," university President Dan Bradley said. Building on a plan developed in 1986 and updated in 1996, the master plan includes an expansion of the Health and Human Services Building to accommodate growth in nursing and health services programs, renovation of the former Terre Haute Federal Building to house the Donald W. Scott College of Business, renovation of 100-year-old Normal Hall - originally the university library - as a potential student academic success center, and partnering with a developer to continue upgrades to student housing. The plan complements a five-year strategic plan which seeks to grow enrollment by 15 percent to 12,000 students, increase experiential learning and expand community engagement while leveraging promising academic programs, recruiting and retaining talented faculty and staff and diversifying revenue from a nearly total reliance on state funding and student fees. The plan also calls on the university to become a key player in efforts to more fully develop the area near the Wabash River. "This is a vision and while everything in the plan may not come to pass it's important to keep the institutional vision looking ahead beyond the immediate," Bradley said. While the university has not yet estimated the cost of the plan, Bradley said most of the projects would be funded without state tax dollars, especially some of the initiatives he expects will be completed within the next five to 10 years. Those include continued improvements to student housing, either by remodeling or replacing existing high-rise residence halls or by working with private developers and relocating track and field facilities to the riverbank. The move would allow a more visible "campus gateway" to be constructed along U.S. 41. The university this week took a significant step toward that goal by acquiring the former Pillsbury/ICON Transportation property at One Sycamore Street. The ISU Foundation purchased the 16-acre tract that extends from First Street west to the river and transferred ownership to the university. The master plan also calls for the eventual construction of a new football stadium west of U.S. 41. That project is likely many years in the future, Bradley said. "This is a concept. It doesn't mean there would be no more retail businesses across the street from the current campus," he said. "It is our intent to be a significant force in Riverscape and in the economic development of Terre Haute." While other athletic facilities will join the baseball field in an area west of the current campus, Bradley said the university's main academic facilities will remain in the same compact area of campus, thus maintaining a pedestrian friendly atmosphere that has been created as a result of the 1986 master plan. In separate action, trustees authorized university administrators to seek state approval to proceed with the Federal Building renovation, a project approved earlier this year by the Indiana General Assembly. The renovation will be paid for by $10 million in bonds eligible for state fee replacement and $10 million in private funding. Trustees endorsed three new programs in the College of Nursing, Health, and Human Services in an effort to better meet the state's challenging health care worker shortage. The programs are a doctor in physical therapy, a doctor of nursing practice and a master of science in physician assistant studies. The programs also need approval by the Indiana Commission for Higher Education. Following a two-year review by the university's human resources office and Mercer Consulting, trustees approved a new salary schedule designed to ensure a competitive and consistent job classification and compensation system. The schedule consolidates 30 separate pay grades into 16 grades. Because of current budget limitations, the initial phase in implementing the new program establishes the ISU salary schedule at 80 percent of market rates and ensures that all employees receive the minimum salary within each pay grade. The board approved bylaws for a new Staff Council that will include administrative, professional and support staff employees. Representation for university employees is currently limited to support staff, via the Support Staff Council, and faculty, via Faculty Senate. A committee of university employees developed the bylaws for the new organization. President Bradley endorsed creation of the Staff Council as a cost-effective means of providing representation to administrative and professional staff that currently do not have representation. "It's important to extend a voice to this vital employee group. This combined council does that without the additional administrative expense that would be created by adding a third employee group," he said. • Adopted an academic calendar for 2011-12 that runs from Aug. 24 through May 7 with winter recess Dec. 23 through Jan. 2 and spring break March 5-9. Photo: http://isuphoto.smugmug.com/photos/744161435_7PCg4-L.jpg - Several athletic facilities would move west of U.S. 41, a new campus gateway would be constructed, and academic facilities and student housing would be upgraded under a new campus master plan Indiana State University trustees accepted during their Dec. 18 meeting. ISU's tree-lined pedestrian friendly campus looks much different than it did 20 years ago and is in line for more dramatic changes under a new facilities master plan.